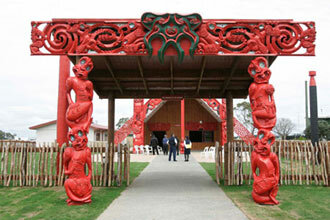 Te Manukanuka o Hoturoa Marae was opened on 11 November 2006. It is a Marae that is adorned with magnificent carvings and tukutuku panels that have been handcrafted by master carvers and weavers. It bears the name of the captain of the Tainui waka Hoturoa who was a great navigator who led the Tainui people to the lands of Aotearoa, New Zealand. The Marae stands proud overlooking the Manukau Harbour and its ancestral lands.